Be the first to share your favorite memory, photo or story of E. Lee. This memorial page is dedicated for family, friends and future generations to celebrate the life of their loved one. E. Lee Wilton of Buehler Home died at UnityPoint Health-Proctor in Peoria on September 26, 2018. She was 90 years old. Born January 23, 1928, in El Paso, Illinois, she was the daughter of Henry W. and Emma (Altorfer) Leman. She married Gerald M. Wilton on April 14, 1950. Survivors include one son, James H. Wilton of Bushnell, Florida, three daughters, Suzanne “Betsy” Wilton of Dunlap,Illinois, Mrs. Larry Baer (Caroline L) of Peoria, Illinois, and Mrs. David Frazelle (Alice A.) of Forsyth, Illinois, six grandchildren and 2 great- grandchildren. She was preceded in death by her husband, Gerald, her son Peter B., and her sister, Alice Conley of Stockton, California. She attended Bethany Baptist Church, was a charter board member of The Peoria Christian Women’s Club, active in Young Life of Central Illinois, a counselor at the Women’s Pregnancy Center, a senior Core leader in Community Bible Study and served on the South Side Mission Auxiliary. She was a member of the Peoria Symphony Guild Puppet Troupe, the Amateur Musical Club, the Junior League of Peoria and PEO Chapter GS. 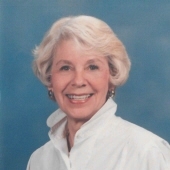 She also was a Red Cross Volunteer and a volunteer choral director at Hines school. She attended Peoria public schools and was a graduate of Bradley University where she was a member of Pi Beta Phi sorority. Services will be at Bethany Baptist Church on October 8, 2018, with the visitation at 9:00 a.m., preceding the funeral at 11:00 a.m. with Rev. Dr. Ritch Boerckel presiding. Entombment will be at the Springdale Mausoleum. Memorials may be made to Bethany Baptist Church or South Side Mission. "Email Address" would like to share the life celebration of E. Lee Wilton. Click on the "link" to go to share a favorite memory or leave a condolence message for the family.